The reality of informal areas around Cairo contrasts with the quiet and peaceful atmosphere of the Sekem private organic farm, located on Belbeis Desert Road roughly 70 kilometres away from Egypt’s capital city. The workshop held in this eco-village within the context of the SwitchMed programme gives people a chance at bringing their passions and their positive dreams to life, away from the hustle and bustle of city life and government bureaucracy. Over four days of collective work, we learn about the stories of people trying to improve their environmental footprint. 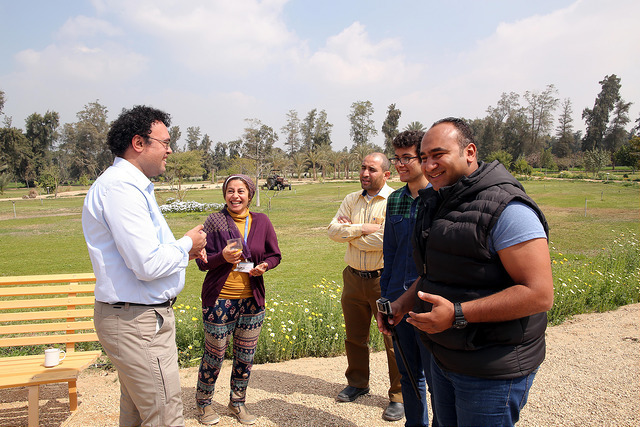 Twenty-four Egyptian participants presented their eco-innovative projects in the context of this European Union funded programme, whose goal is to strengthen the rapid expansion of sustainable consumption and production in the Mediterranean region. At first, they are seated in a circle before being divided into small groups to be able to better discuss topics such as the challenges and structures of their projects, which are at different stages of development. There is no doubt that their discussions lead to more creative social and ecological solutions. Read the full article by Dalia Chams via EU Neighbours South. Scientists look to the past for food security solutions. 2018 UfM Climate Week in Barcelona | 23-25 April 2018.